Each year, literature fans, writers and scholars from across the state and the country descend upon the San Francisco Bay Area to attend the aptly named Litquake literary festival, which takes place in venues throughout the Bay Area over a week-long period in October. Joining those spaces that host events as part of this unique literary gathering, the historic San Francisco Elks Lodge will welcome some of the strongest voices in Latino literature today, with a not-to-be-missed evening program titled “No Burritos: a Night with HUIZACHE Magazine.” The program and reading will be held on October 14th from 6:30 pm. to 9:00 pm. 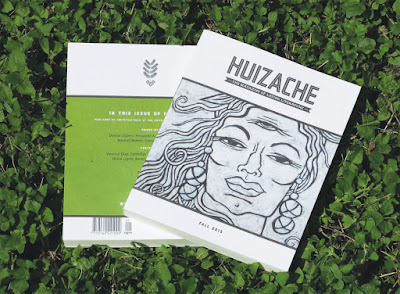 HUIZACHE—which has been called “the Paris Review of Latino Literature”—seeks to explode ethnic, gender and social stereotypes with world-caliber fiction, poetry, essays and prose. On October 14th, LitQuake proudly presents the celebration of HUIZACHE’s fifth issue with readings by San Francisco’s Poet Laureate Alejandro Murguía, former Poet Laureate devorah major, fiery fictionist Alia Volz, journalist Rúben Martínez, award-winning poet Lorna Dee Cervantes, and acclaimed novelist Dagoberto Gilb. An exclusive, all-acoustic musical set will be provided by LA-based Sin Color—an exciting new band featuring 20 year-old singer-songwriter Crisia Regalado and guitar player-composer David Aquino—who have been taken under-wing by Annette Torres, a former member and co-founder of LA's Las Cafeteras, a popular group which follows in the footsteps of the Grammy Award-winning Quetzal as neo-traditional exponents of the famed "East Side" sound fused with the sounds of Mexico's Afro-indigenous son jarocho. The HUIZACHE fete, already generating a serious buzz, unfolds at the San Francisco Elks Lodge, which was chartered in 1873 and is the oldest extant Elks Lodge in the country. Housed within The Kensington Park Hotel, an equally historic and elegantly appointed old-world jewel on Union Square in downtown San Francisco, the normally private club occupies the hotel’s third floor. The local Elks and the Kensington staff are honored, say Lodge ambassadors and hotel representatives, to open their prestigious doors for this groundbreaking, multicultural literary event. The celebration begins with a cocktail reception followed by readings and live music. The newly minted HUIZACHE will, of course, be made available at a special price. According to event co-organizer and featured reader Alia Volz, whose work also appears in the latest issue of HUIZACHE, the reading is open to all ages. The new issue of HUIZACHE is graced by a cover that features the avant-garde graphic work of LA artist and ASCO Art collective co-founder Diane Gamboa. It also includes full-color plates by Caribbean painter Claude Fiddler, poetry by one of the East Coast’s most beloved poets, Cornelius Eady, fiction by the still-rising Chicano star Manuel Muñoz, an essay by a Chicana already in the pantheon, Denise Chávez and a mythic origin memoir by a homeless colombiana in New York City, María López. “Bay Area denizens and Litquake aficionados alike should not pass up this rare opportunity to enjoy the finest in Latino literature, while relaxing inside the legendary halls of one of San Francisco’s favorite hidden gems,” Volz advises. The Kensington Park Hotel is located at 450 Post Street, San Francisco, California 94102.